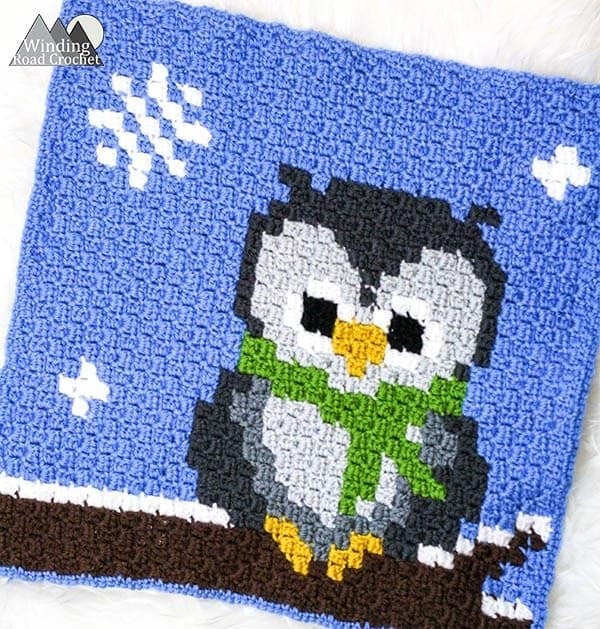 The Wise Old Owl C2C graph is the last square in my Woodland Winter Wonderland Blanket I will be sharing during fall and winter this year. I have released a new graph almost every week for 8 weeks and I am so happy with how this blanket is turning out. I will be providing an optional top and bottom banner for this blanket next week. I will not be making the banner myself (maybe next year) but I will be sharing the graph and providing some inspiration on how to use the banners. The Wise Old Owl is the last to arrive to the Winter Celebration. His old bones may ache but he would never miss spending time in peace and harmony with his woodland friends. Perched up high he watches as everyone jumps and plays around a decorated tree. My Woodland Winter Wonderland Corner to Corner (C2C) Crochet Blanket will be made of 6 character squares and 3 rectangles. The scene depicts all the woodland creature coming together to share and celebrate the winter season with gifts and decorations. There will be an optional top and bottom banner as well. If you are going to be crocheting for Christmas this year make sure you check out my Handmade Gift Giving Guide to make the perfect give for everyone on your list. Check out all my free patterns here and some of my fall favorites below. Feel free to change the colors of the scarf and present to any color you want. It is a great way to use up left over yarn in Vanna’s Choice. I kept the presents and scarves the same through out the project to minimize the number of colors needed. For this square I used a size H hook and had a 19 inch by 19 inch square. This will give me a blanket that measures 57 inch x 76 inch blanket. I also tried a size G crochet hook and it measures 16 inches x 16 inches. This will give me a 48 inches x 64 inch blanket when completed. I chose use a Size H hook when making the blanket and a G hook when using this pattern for pillows. I find corner to corner crochet is best learned through videos, so I have compiled a playlist of helpful videos for anyone who is looking to learn or wants some tips for making C2C easier! A Solution to Tangled Yarn! I have been working on these C2C Woodland Critters for the last few months and I have had quite a few tangled messes to deal with! Well I have finally found a simple solution and I want to share it with you. I have designed a Yarn Bobbin that is printable and available for free to all my newsletter subscribers! Check out the Yarn Bobbin Tutorial to learn how to quickly make these bobbins and how to use them. They will can prevent so much frustration. I wish I had thought of them sooner. Check it out!. Scroll down just a bit to see the form to sign up for the newsletter! You can also get the written chart for all the graphs as well! Corner to corner is not the only way this chart can be used! You can use this graph with the granny square pixel method to create a blanket using a single graph. You can also do tapestry crochet and use single crochet stitches to make a smaller square. The bobble stitch graph method is also very popular lately. These graphs would look great as a wall hanging or for the front of a winter tote! Note: For the pictures shown I used the C2C method with Half double crochet stitches instead of double crochet. This gives me a tighter stitch. To use Half Double Crochet just chain 5 instead of 6 when increasing and chain up 2 instead of three. Quick note about my graphs! I do start in the bottom left corner. To finish my rectangle I Single Crocheted around the edge. To do this you will single crochet into the top or bottom of each stitch and work two single crochet into the sides of each stitch. When I was finished I just stretched my work a little bit until it looked like a square. You can also block the square as well. Are you going to make a Woodland Winter Wonderland Blanket? I would love to see your Little Gray Rabbit C2C square, so share it with me on any social media! Just tag me @windingroadcrochet, #windingroadcrochet, or #ourcrochetjourney. I will be providing an optional top and bottom banner and a few different ways to combine the banners with the blanket. I am not personally working up the banners this year (maybe next year), but I wanted to be provide the graphs for you.